Redefining Misbehavior Part I: What is Misbehavior? I was really at my wit’s end. She was moving so slow and refusing to cooperate with me helping her get dressed. Of course, this was the second outfit since she had peed in after being repeatedly asked if she had to go (and adamantly refusing to wear a diaper). Besides, she knows how to dress herself – she just did it yesterday! I knew she didn’t want to go to this doctor’s appointment, and she was making sure I knew it by giving me a hard time about every. single. thing. Talking back and telling me no. I want to pull my hair out with frustration! What should I do? What techniques can I use to get her to obey me and stop her misbehavior? Should I spank her? Put her in time out? Take away her TV privileges? Would your answer differ if I told you I was talking about my 82 year old grandmother with Alzheimer’s? My mom had this exact experience with her mother (my grandma) in the last years of her life. You could see the strain it had on my mom to try to get her own mother to do what was necessary for her health. She would have to grit her teeth and sometimes take a time out herself to calm down. What is the difference between my toddler and my grandma? Certainly not the behavior – they are almost identical ways of “acting out” and driving me nuts. Not “authority” since by this point my mother had complete power of attorney for her mother. It is simply age that dictates we provide endless, endless patience and respect to one and a great deal of impatience and disrespect to the other. We are conditioned by society to believe that children need to be trained and molded to obey. We have to wrestle them kicking and screaming toward “normal,” society-approved behavior. Instead of seeing their immature behavior as a natural expression of their mental state we see it as a flaw that needs to be trained out of them. With my grandma we take for granted that her behavior is a characteristic of her mental state and that she can’t be trained out of it. I certainly don’t mean to marginalize Alzheimer’s disease. My purpose is to question the way we treat kids. A child is just a name for a human being whose brain (mental state) is not fully developed. Their impulse control, social communication, and emotions are not regulated to the same extent they will be when they reach adulthood. You can’t really speed this process up – your 3 year old is not going to process things like a 30 year old no matter how much you wish it were true. Conversely, a 30 year old would not process like a 3 year old without something atypical about his mental state. That difference is not the result of training but of maturity. With this in mind I’d like to look at the concept of “misbehavior” in children. What is it? Why do they do it and why do we call it that? Misbehavior is behavior that is inappropriate. That’s kind of arbitrary isn’t it? This can mean it is universally inappropriate, like hitting another person. Or, it can be a definition of appropriate in your social group – like society not approving of pants for women in the early 20th century or a family having a prohibition against using “bad” words. The idea of misbehavior requires an explicit or implicit agreement on the desired behavior. Then, behavior outside of that is called misbehavior. This point is important because it means misbehavior is a matter of perspective. I allow my kids to jump on the couch (one couch, in the family room, and only when I open the “gym”). This works for me but I realize this would be misbehavior in someone else’s home. There is something very freeing about realizing that misbehavior is a matter of perspective. There isn’t some universal “thou shalt not” for parenting that we all must follow. Just like there is no rulebook for how spouses should interact. That’s not to say there isn’t a lot of pressure from society to make your kids behave in a specific way. There are opinions everywhere from “kids should be seen and not heard” to “little girls shouldn’t climb trees.” However, as with the cultural stories of parenthood, YOU get to choose which definitions of misbehavior are important to you. Do you ever find yourself thinking, “why am I saying no to this?” Like splashing in a puddle or running at the park. I’ve seen parents say no to both of these things and I’ve felt the urge as well. But, really, how fun is jumping in a puddle? And if you can’t run at a park where can you run? Is that explanation all about my convenience? If yes to #2, what if the child’s needs were given the same importance as mine? Puddles are dirty water. Her shoes are new. She’ll get my car muddy! What will that lady over there with the perfectly dressed kid think? What if I view her joy from puddle splashing as an important and valuable need? Now, perhaps you have to go to the doctor after the park so you really can’t have her muddy from the knees down – that’s a valid reason. Tell her so and promise to return to the park when there is nothing else to do and splash away! Maybe it is valid that you can’t get your car muddy (is it a lease) but is there a way to work around that (put a bag down, change shoes first, etc.) if you saw her need to jump as just as important as your need to keep the car clean? It’s that #3 that’s the stickler. We, as a culture, put much more importance on the needs of an adult over those of a child. Our kids can have fun and be kids as long as we aren’t inconvenienced in any way. If we turn that notion on its head and decide that each human’s needs are of equal importance, and that there is always a way to meet everyone’s needs, then how our parenting would change! We would see “misbehavior” as a challenge and discipline as problem solving. We would have fun! We would have a clean car AND a happy kid. Reframing misbehavior is really a win-win of the best kind. 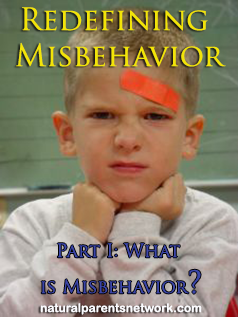 Stay tuned for the next part of the Redefining Misbehavior Series where we’ll look at what drives misbehavior. How do you reframe your children’s behavior to meet everyone’s needs? 2 Responses to Redefining Misbehavior Part I: What is Misbehavior? Beautiful article, Paige! I thought back to the last time I said my 2 year old was “misbehaving” and I think I can honestly say that it was because I ran out of patience. Oh dear. Thank you for the reminder that this is merely a challenge and a chance to teach instead of an inconvenience. I love the way an issue can be turned on its head the way you did in your introduction, Paige. Thanks for making me ponder misbehavior from such a different perspective. The point you make that I most identified with when I first became a parent is this question: “What will that lady over there with the perfectly dressed kids think?” Once I managed to ignore my anxiety over what other people think of my kids, I have been able to let go more and allow them to make their own choices when it is safe to do so. Recently I’ve found myself with the reverse problem; I struggled to find my own identity as a person with needs outside my role of mom. I so often learned to give my kids equal ground that I managed to put their needs and desires above my own. It has certainly been a challenge to strike a balance, but I’m happier (and so are they!) now that I’ve given myself permission to put myself first when I feel the need. I know you are writing a series on this topic, so perhaps you will address that question (i.e. how do we balance our needs and our children’s?) in a future article. I look forward to the discussion.